Though part of this historic cemetery lies in Cherokee County, it sits along the South Carolina-North Carolina border and is primarily within the town limits of Grover, North Carolina. While only four headstones actually rest within South Carolina – with 104 in North Carolina – the sacred site remains important to South Carolina’s history. Many of the soapstone grave markers, considered to possess fine funerary artistry, were created by stone carvers from the Caveny and Crawford families of York County. The cemetery dates to 1780 and is associated with the Shiloh Meeting House, also called Shiloh Presbyterian, which relocated from the rural outskirts of Grover to town in the early twentieth century. The move severed responsibilities of the church to the cemetery, leaving maintenance to family members of those interred at Shiloh. The last interment here is dated 1916. Buried within the cemetery are Patriots killed at the Battle of Kings Mountain during the Revolutionary War as well as Confederate soldiers who fought in the Civil War. 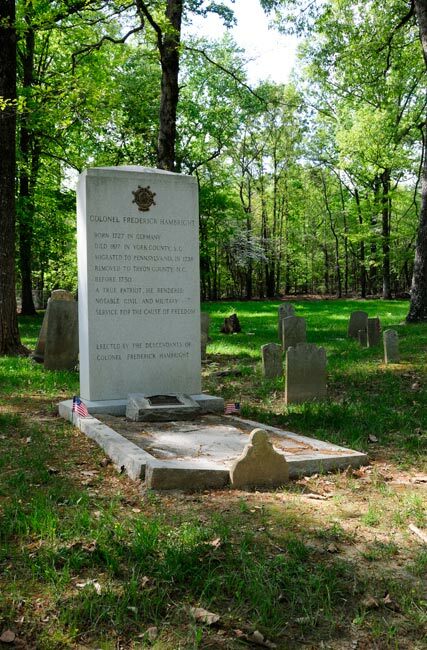 The first person to be laid to rest at the Shiloh Presbyterian Cemetery was William Patterson, who died at the Battle of Kings Mountain. Another veteran of that battle was Colonel Frederick Hambright, whose marker is seen above. The current headstone replaced the original and was dedicated to Hambright in 2009 during a ceremony led by the Sons of the American Revolution. Hambright was an elder of Shiloh Presbyterian. Today the Shiloh Presbyterian Cemetery is cared for by the Historic Shelby Foundation, which is based in North Carolina. The Shiloh Presbyterian Church Cemetery, located on both sides of the North Carolina-South Carolina state line, was established in 1780 in conjunction with the construction of the Shiloh Meeting House, the building in which the Shiloh Presbyterian Church congregation held its earliest services, and the burial of Revolutionary War hero William Patterson, who died on October 7, 1780, the day of the Battle of Kings Mountain, and was the first person interred at the cemetery. The cemetery is the oldest burying ground in the southeast section of Cleveland County, North Carolina, serving the Shiloh Presbyterian Church’s congregation and area settlers until the last person was interred at the cemetery in 1916. The cemetery is significant as a small, rural church cemetery with gravestones of artistic value. The majority of the gravestones possess the distinctive craftsmanship of noted York County, South Carolina stonecutters John Caveny, Robert C. Caveny, James Crawford, William N. Crawford and Robert M. Crawford. These gravestones were made from greenish schist and soapstone quarried from the Kings Mountain in South Carolina from 1780s to the 1820s, and marble blanks purchased from Charleston and Columbia from the 1830s to the 1870s. There is a combination of tombstone forms such as semicircular- and segmental-arched with rounded caps, discoidal shoulders, pointed arches, or beaded edges, and tombstones with tympanums with nineteenth-century motifs such as quarter sunbursts, eight-pointed compass stars, willow trees, hearts, and trees of life.